"The best gamification is done seemlessly. It's built into the core of the product and experience, and it is aligned with the business' goals. You don't just slap it on and hope that it fixes user engagement or conversion rates. If it is, it looks really cheesy. Users see through it. They develop an immunity to it and they don't want to see any more of it. So, that's why the know how of how to apply gamification is probably even more important than the technologies and tools behind it right now. That's always true in embryonic industries. It was the same for CRM, analytics and all these other fields as well." "People don't really want self-service tools. They want you to tell them what to do." Gamification done right is not easy. It requires the integration of complex systems and uses engagement strategies and tactics from a diverse set of disciplines from sociology and psychology to human computer interaction design and of course game design. Furthermore, unlike other enterprise software projects of the past which required large up-front efforts and minimal work to maintain, gamification typically requires as much effort to monitor, maintain and update as it does to launch. 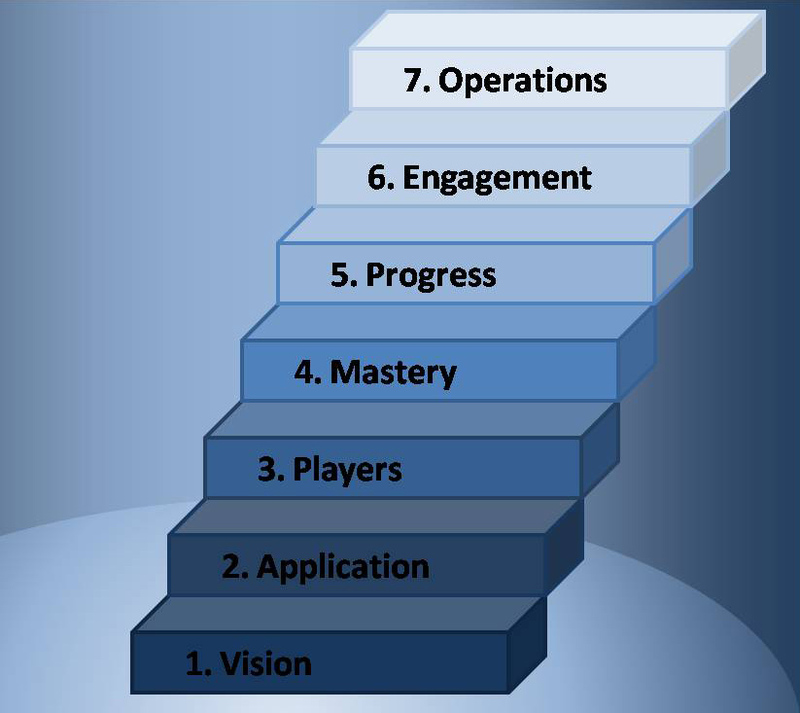 The seven step process that follows can help manage this complexity and move gamification projects from promise to reality. I developed these steps based on my work with clients and lessons learned from designing and managing games at Fastpoint Games. They also incorporate many of the concepts first articulated by gamification pioneers Amy Jo Kim, Jesse Schell, Gabe Zichermann, Mario Herger, Nir Eyal, Nicole Lazzaro, and Jane McGonigal. Wanda Meloni presented the latest gamification industry market research from M2 Research at the GSummit in San Francisco in June. M2 estimates that revenue in the consumer and enterprise gamification market would grow to $242 million by the end of the year, which represents over 150% growth year-over-year and would reach over $2 billion by 2016. M2 also reports that in 2012 the enterprise gamification will represent 38% of the market compared to 10% in 2011. In fact corporate initiatives represented the largest market segment (25%). The entertainment and media segments followed at 18% and 17% respectively. Consumer goods and retail segments came in at 10% and 9%. Telecom had 5%. The Health & Wellness, Education and Financial all had 4% share with government and utilities each representing just 1%. 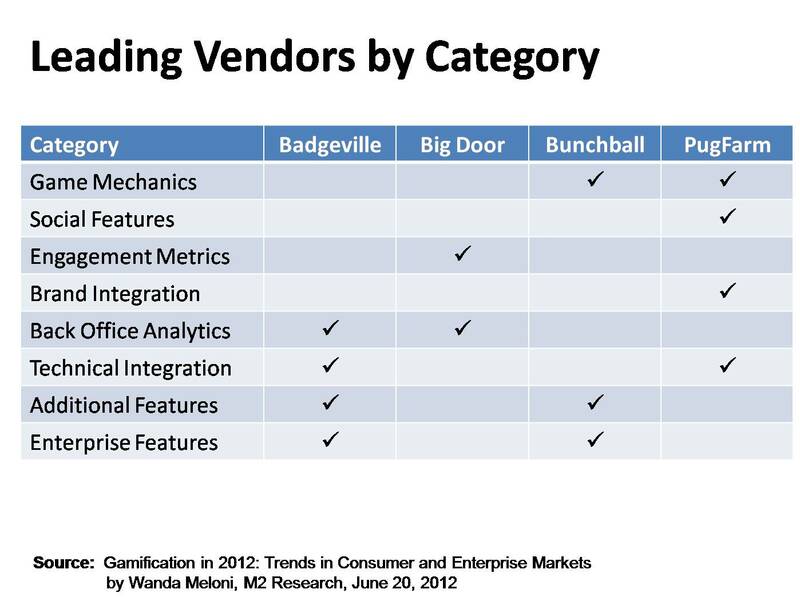 Ms. Maloni also present results from M2's survey of four gamification platform vendors (Badgeville, Bigdoor, Bunchball, and PugPharm). The first part of the survey asked each vendor to specify the features they currently supported across several different categories. 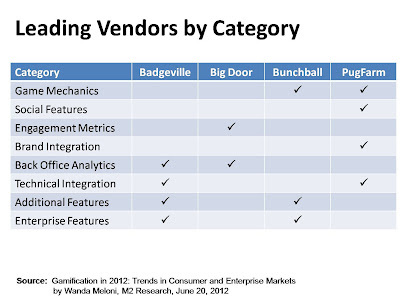 Note: Leading vendors are the ones that currently have the most complete set of features for a category. Additional features include mobile support, user groups, consulting support, education, maintenance and marketing support.